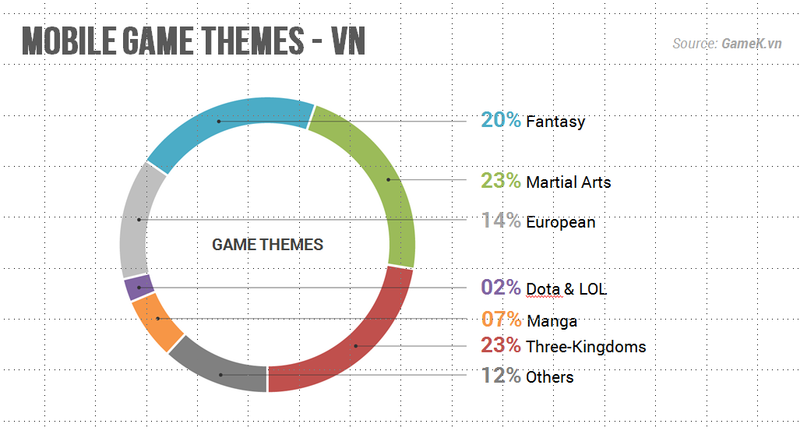 Vietnam is one of the most attractive destinations for mobile game developers. 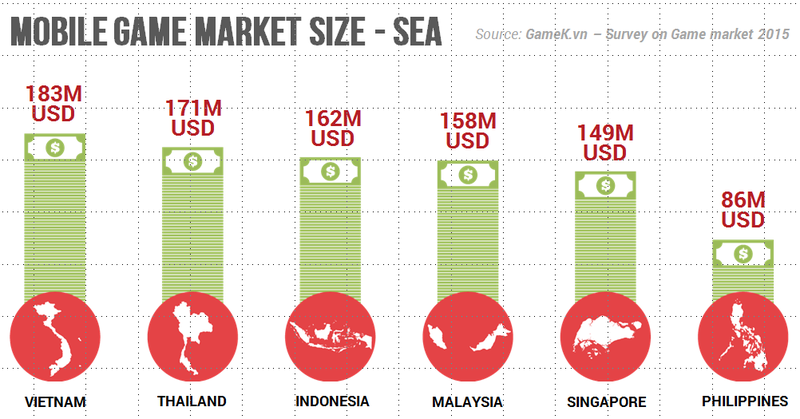 As GameK.VN suggests, it is now the largest mobile game market in Southeast Asia. It becomes apparent when we see the revenue from 3rd party payment which is not often included in reports. I highly recommend the foreign game developers with high quality games to enter Vietnam market because it is getting harder to succeed in developed countries such as Japan, USA and China due to the high competition and Vietnam market is growing rapidly. I also suggest that it is a good idea to have several revenue sources in developed countries for base revenue in the future. First of all, I will summarize general information about Vietnam. 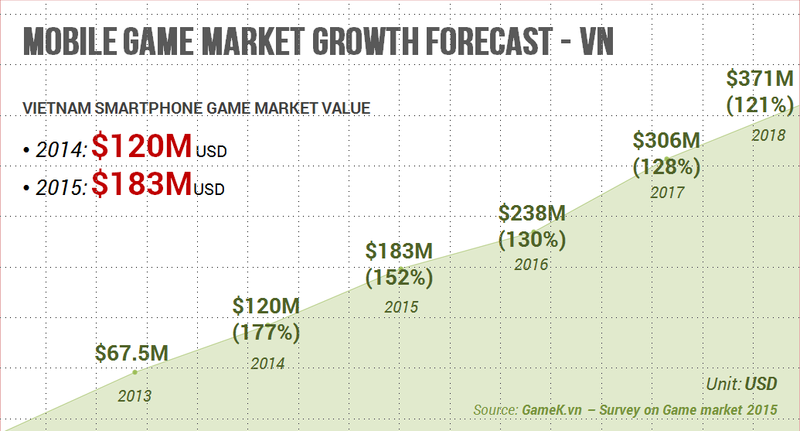 As you see down below, we can expect Vietnam mobile game market to keep growing with high growth rate. I would like to share 5 tips that we should know before entering Vietnam market. I cannot guarantee foreign game developers 50M USD in Vietnam. Top titles in Vietnam get 1.5 M to 2.0 M USD per month and hit titles earn about 0.7M USD per month in Vietnam. I know some foreign game developers entered Southeast Asian market with too much effort and left because their effort did not meet their expectation. Important thing is that we should know the appropriate market size and decide how much effort we should put on. As you know credit card penetration in Southeast Asia is very low. 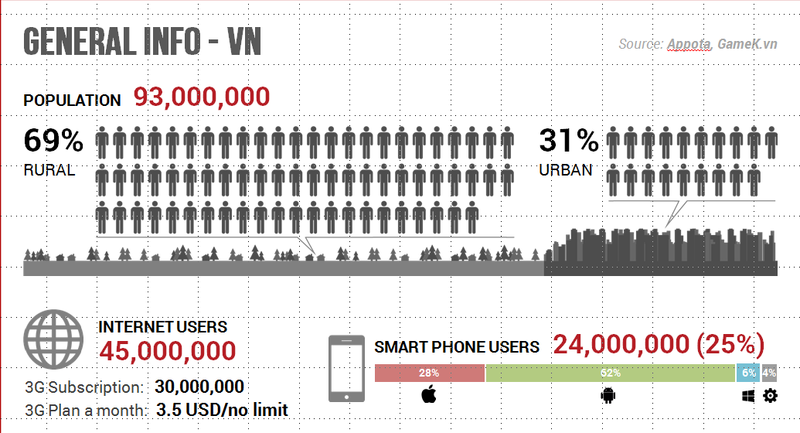 In Vietnam it is just 3% (Source: Vietnam finace.vn). However, there are alternative methods for gamers to pay for mobile games like Phone/Game card and Bank Card. 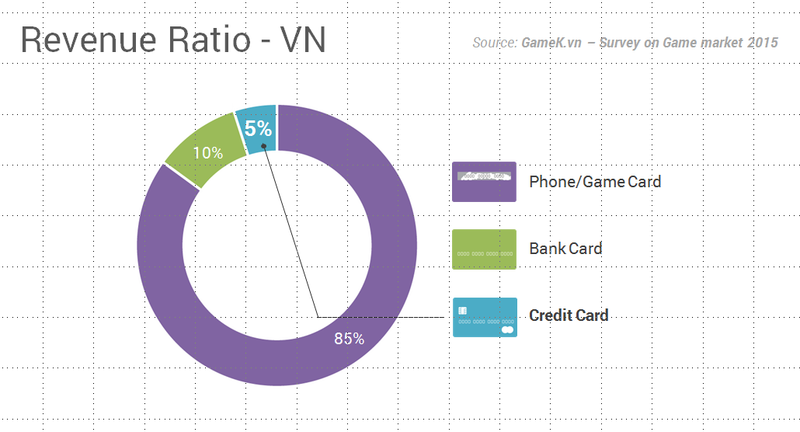 This is revenue ratio of each payment method. Obviously we have to consider local payment method. 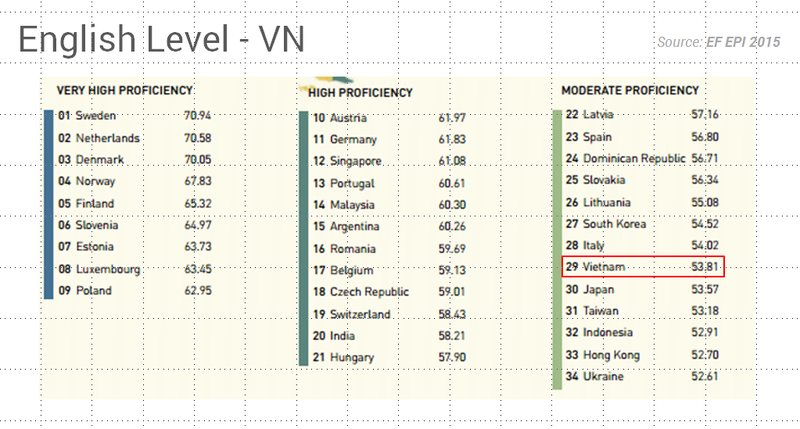 It is true that so many English apps get high ranks in Vietnam but it is not because usual Vietnamese hold high English proficiency but just because there are very few good games which are localized for Vietnamese audience, meaning that there is a great room for foreign game developers to get into. 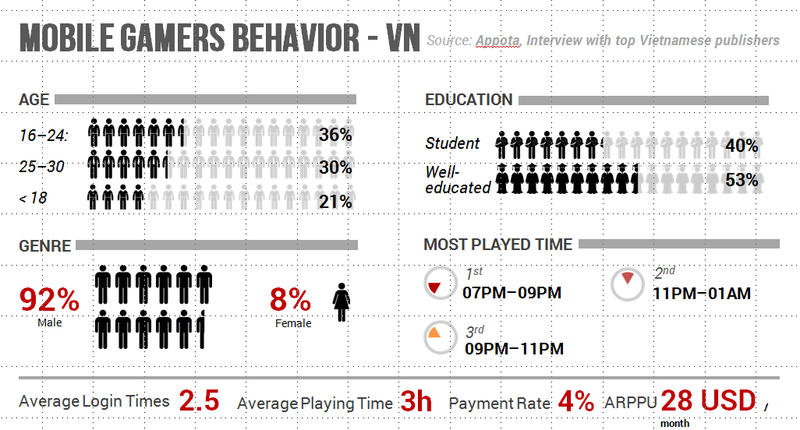 This might not be a familiar topic to you when it comes to Vietnam mobile game Apps. I used the word “basically” because there are many apps that come from overseas without license on Vietnamese App store because it is very hard for the government to police all the apps. However, the supervision is getting stricter and stricter that some companies have been punished for the lack of license. The big difference is that in Vietnam, game companies cannot proceed mass promotion like TVCM and outdoor advertising because of law. And there are so many fraud traffic in Vietnam even some ad companies use incent traffic for non-incent campaign and so on. To find right partner is very important. 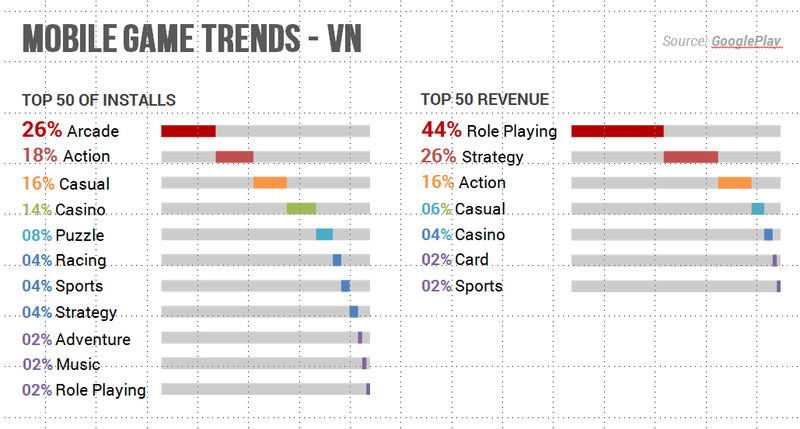 Vietnam is not an easy market but I believe it is worth trying if foreign game developers understand about the market. We Adways Vietnam was established in 2015 and have helped many both foreign and local game developers to succeed in Vietnam. We have 3 services, incentive ad network, AppDriver Asia, non-incentive ad network, Seads and Pre-registration service.